I am honored to have another guest blogger today. Today we have Barbara from "My life as an adventure" blog. Please make her feel welcome and be blessed by her message. I call myself a clutz; He calls me sanctified in Him. David was an adulterer, yet God called him a man after His own heart. I call myself a loser; He calls me an over-comer in Him. Gideon hid in the winepress, and God called him a mighty warrior. I call myself weak; He says I am strong in Him. You see your husband as a loser, and God calls him a priest over his household. I call myself a simple girl; He calls me a daughter of the King. You can contact her at barbsfitu@gmail.com. What a powerful message Barbara. I appreciate you sharing with us. and have been homeschooling for almost 17 years this December. from farming, our family is seeking to farm our small piece of heaven. learning to make do with what we have. Do you do what I do? Every year, I forget to harvest some of my radishes on time and they end up growing thick stalks and the radishes become woody and inedible. In previous years, I wasn’t sure what to do about this, except to throw them on the compost pile (if I had one) or throw them in the green trash dispenser that our city provides for us. But this year, I got smart. I became interested in seed saving last year which led me to some research on how to save seeds from the plants that I grow each year. One of those, of course, is radish, and so rather than yanking the woody radishes out of the ground and throwing them away, instead I allowed them to continue growing. They grew to about 4 feet high and bloomed with the most adorable, delicate little flowers. The bees loved them! The pollinated for days, allowing the plants to produce an abundance of lovely little seed pods, hopefully full of seeds! Once the plants start dying off and the seed pods turn brown, it’s time to pull up the plants and set them in a well-ventilated area to dry. You can stack or hang them, either way is fine, they just need to be able to dry completely. Once the pods are completely dry, they are ready to be broken open for seed harvesting. You may notice that the inside of the pods are very similar to styrofoam. I wonder if that’s where man got the idea for it? Once you have finished your harvesting, store the seeds in a sealed container in a cool, dry place. Seed viability is about 5 years, so make sure you label your container with what type of seeds and the year you harvested the seed. *Aside from the experience, any additional seed harvesting information came from the book Seed Sowing and Saving by Carole B. Turner (Storey’s Gardening Skills Illustrated series). Thank you Kristi for a great post and for teaching us something important. We have been harvesting a lot of fresh veggies this past week. I love eating fresh vegetables but when you have a big garden like we do, you couldn’t possibly eat them all before they go bad. What to do? We can them. Fresh tomatoes are canned whole, stewed and diced or made into marinara sauce, spaghetti sauce, pizza sauce, relish, or jam. 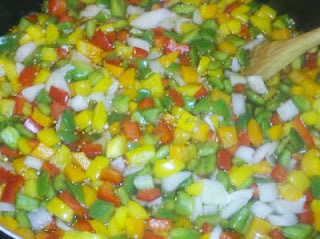 Bellpeppers are cut up and some are frozen and others are canned into relishes. There are so many possibilities. One thing we make and can every year is sweet pepper relish. It tastes so good on summer hot dogs. 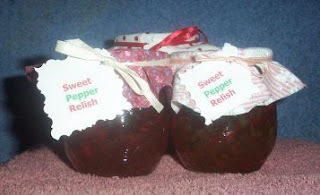 Here is my recipe for sweet pepper relish that we love. Wash the bell peppers and remove the seeds. Dice the peppers and onions. Put all ingredients into a large pot, stir well and let it come to a boil over medium heat, stirring occasionally. Let it boil for 27 minutes and then remove from heat and pour into sterilized jars. Leave about ½” room at the top. Wipe off rims well. Seal the jars and process them for 15 minutes. This will make about 7 half pint jars or 4 pint jars. Doesn't this look so pretty as it cooks?! This relish goes so good on homemade hamburgers served on homemade hamburger buns! Have you ever felt like an overstretched rubber band? Where you have been pulled in all different directions for too long? That is how I have been feeling lately. My MS (multiple sclerosis) has been acting up and we opened up our Fireworks Store this week. That means I am down there at the store from the 15th of June until the 4th of July, every single day from 9:30 a.m. until 10 p.m. or as late as 1 a.m. No days off. On top of that, I have the boys down here with me so I am entertaining them to boot. I also have my college studies to do (Master's Degree program) and normal life duties. I am not trying to complain but am just running on empty and need a recharge. Pray for me. Pray for our Fireworks store. Be well! Melt butter in a medium sized sauce pan over medium heat. Add oil and let it get hot. For the smoked sausage, either use a one pound package and slice up or use the smoked sausage links (we used 8 of them). Cook the sausage in the oil/butter for 5 minutes. Add in the spices and cook for one minute. Stir in tomatoes then the chicken broth and finally the rice. Stir well and bring to a boil. Stir more and bring back to a boil. Turn to simmer and simmer covered for 5 minutes. Recently, I learned of a way to make fresh corn-on-the-cob easily. 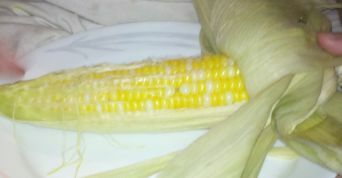 I don't know about you but I love corn-on-the-cob but rarely eat it fresh because it is a pain in the caboose to cook. I have always hated peeling off the husk and then those bloody silks! It took forever to get them off. Then you have to boil them forever (or so it seems). That is why I was thrilled to learn that you could cook the corn (in the husk) in the microwave. Believe me, I was skeptical but not anymore. It works. Here is how it is done! Take your fresh ear of corn and lay it on a plate. Now take a wet paper towel and place it over the ear of corn. Now place it in the microwave for 4 1/2 minutes. Now here is the corn ready to eat! 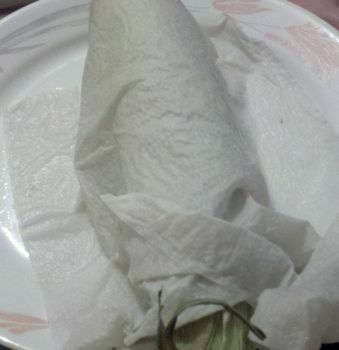 The corn steams itself inside the husk. Tastes delicious and ready to eat in under 5 minutes! Another friend told me that they heard you could cook your corn on the cob in the husk in a big ice chest but I researched this and do NOT recommend this. Ice chests are made to keep things cool. With extreme heat (like boiling water), the plastics inside the ice chest can start to break down and leak potentially dangerous chemicals into your corn. I am not willing to take that chance. 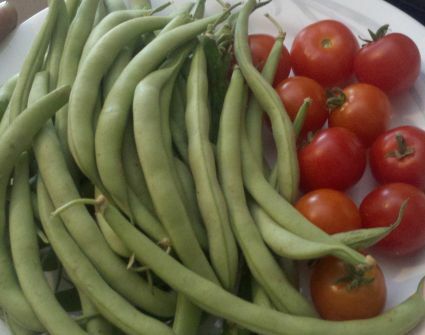 Today we were able to harvest some fresh green beans and cherry tomatoes from the garden. The tomatoes were so plump and great tasting. So much better than from the store. First, wash off the green beans. 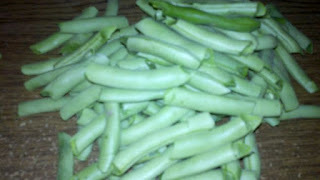 Once they are clean, snap off the ends of the green beans and then cut the green beans into 1" to 1 1/2" pieces. 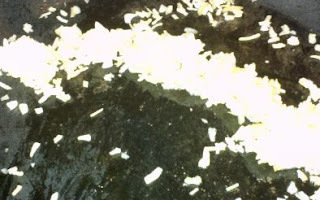 Cut up some fresh onion or use dried onion and saute' it in some bacon grease. 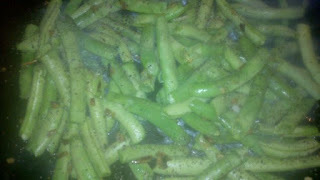 Once the onions are softened, add in the green beans and cook them for 2-3 minutes. Then add in one can of chicken broth and turn up the stove to medium-to-high and let it cool for 20 minutes. 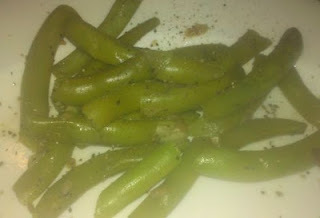 And here is a plate of fresh green beans we had for supper. To be honest, we did not cook them for 20 minutes. My hubby and teenage son couldn't wait that long. They ate them after it cooked for 5 minutes. They were still crisp! These "Mocha Tartlets" will be the hors d'oevre for the party (unless I change my mind between now and then). 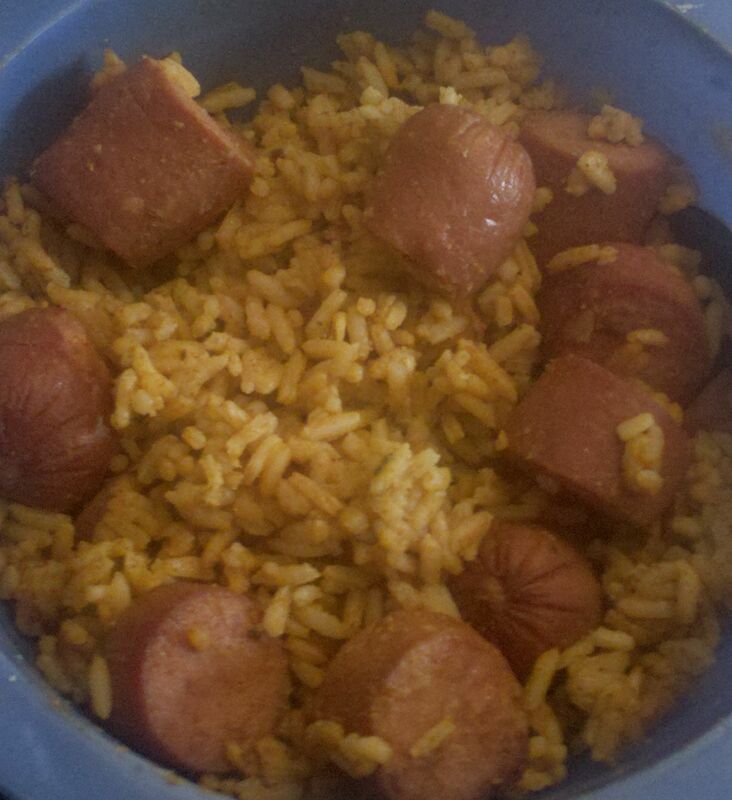 We made 28 of them and between my hubby and my 2 boys, they were all gone in an hour. Needless to say, they loved them. I did manage to get two of them and they were delicious as always. If you do make them for a party, do not let on how simple they are to make. Everyone will go on and on about them and let them assume you slaved to make them. Place the heavy cream, sugar, cappuccino powder and vanilla into a mixing bowl. Using an electric mixer, whip the heavy cream mixture until stiff peaks form. 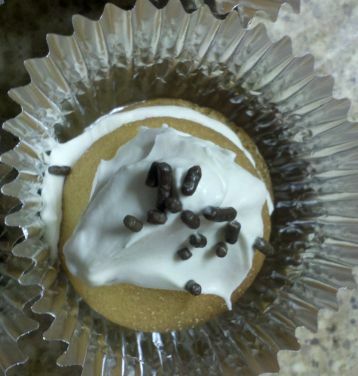 Using foil cupcake tins, place a wafer in the bottom, place 1 tsp. of whipping cream mixture on top. Place another wafer on top and then another teaspoon of whipping cream. Finally, sprinkle on the chocolate sprinkles and chill for 2 hours to soften the wafers or eat immediately. 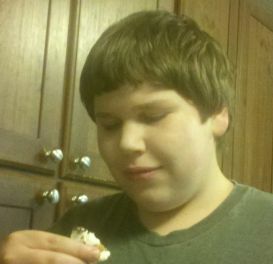 My son, Brandon, getting ready to enjoy the tartlet. 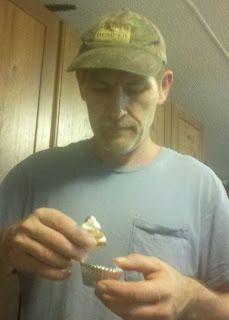 My husband getting ready to eat the tartlet. The funniest part of this all was watching my husband lick the beaters like he was a little kid. He was having such a good time licking them that he refused to share. That's my babe! Found a new blog link up today. It had an interesting challenge: Write for 5 minutes. Be real. Unscripted. Wow! Can I do this? I am a person who plans EVERYTHING! When we are going to go on vacation, I research everything. Last vacation, we had a 3 ring binder FULL of information that I had found, researched, and categorized. Did we need it? I hope so but probably not. It is just the kind of person I am. Guess it is my OCD in me. Went to the grocery store today and did our once a month grocery shopping. Didn't get as much as last month. Everything is going up higher and higher. Noticed the price of hamburger meat had jumped 30 cents since last month. Another one of my talents, I can remember prices of virtually every item I pick up at the grocery store. I catch the clerk making mistakes and calling her on them too. If you are ever behind me in the checkout lane, I do make them do price checks. Sorry but 10 cents at a time (or whatever the amount is) adds up after awhile. I can also know my total within $5 every time. The closest I ever got was $0.43. Well, that was my 5 minutes of rambling. What would you talk about for 5 minutes? We have a new business adventure in the mix. We have been out of work for quite some time but God has answered our prayers and has provided a few opportunities for us. We have been very busy this week trying to iron out all the details. We have taken this entire week off to rest and recharge. It was a much needed vacation! Take breaks when you are worn down or discouraged. Take a day or two or even an entire week. When you come back to it, everyone is better off for it. Don't try to follow set schedules to the "t". Wing it and have fun. the people that God sends into my life. When I am discouraged or sad, He sends the right people to me to send me a message. Sometimes it is just by a post on facebook. It is just another reminder that He is in charge and is looking after me. Was being with my family all week and starting a new chapter of our lives together. I love my family so much and love being with them 24 hours a day. our new business to be successful. To keep listening to God's words and for Him to continue to guide us. What is going on in your life this week? Have a prayer request? I would gladly pray for you.